Steve Dezember and his wife Hope, who is his full-time caretaker. 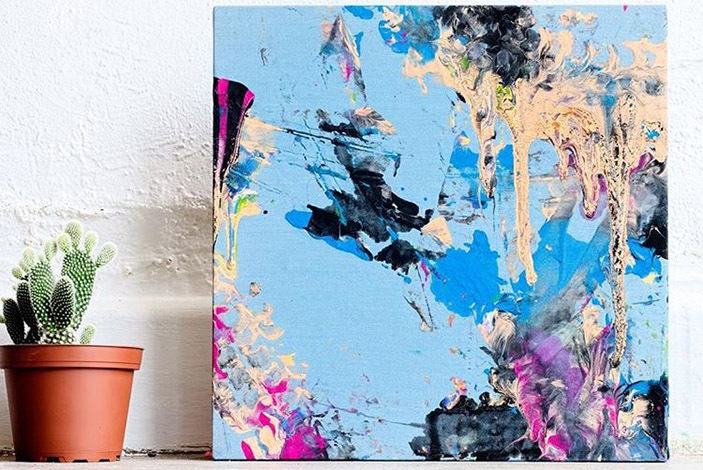 Dezember uses his wheelchair to paint abstract pieces of art. Using his wheelchair, Dezember recently painted and donated a piece of art to Emory Johns Creek Hospital's ICU. Dezember was diagnosed with ALS in 2011 when he was 28. A patient at Emory Johns Creek Hospital (EJCH) living with amyotrophic lateral sclerosis (ALS), also known as Lou Gehrig’s disease, is using art to raise awareness and funds to help fight the disease. ALS is a progressive neurodegenerative disease that affects nerve cells in the brain and the spinal cord that control voluntary muscle movement. The disorder causes rapidly progressive weakness, muscle atrophy, muscle spasticity, difficulty speaking, difficulty swallowing, and decline in breathing ability. 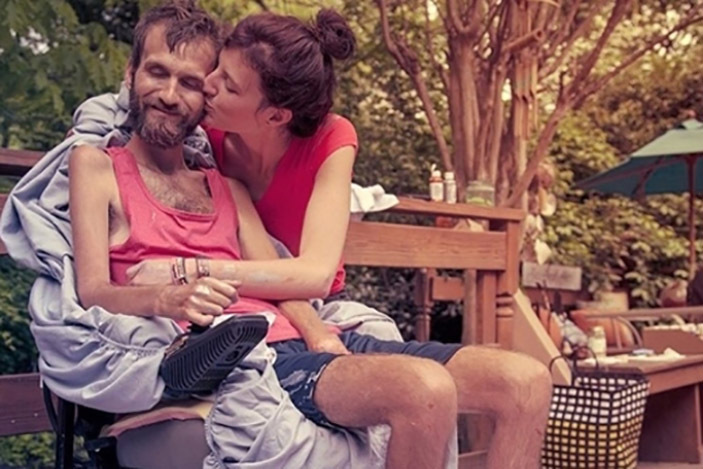 Steve Dezember, 35, is using his love for art to spread awareness about the disease. 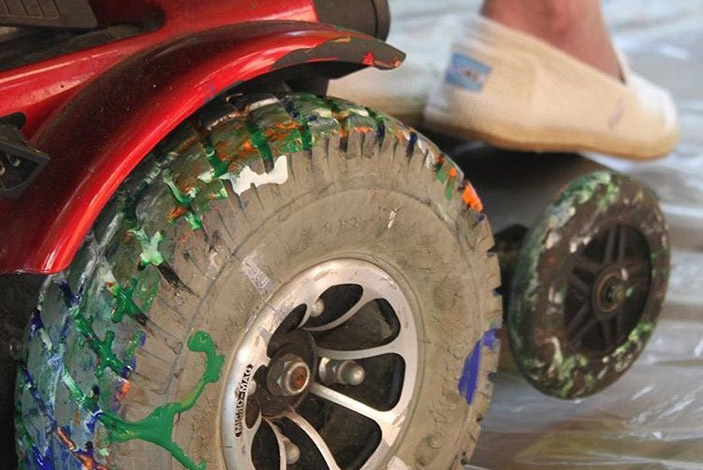 He uses his wheelchair to paint abstract pieces of art. Proceeds from the sales are given to ALS research and to help cover his continuous medical expenses. "I want people to know, even if you have limitations you can still make an impact on the world and have fun while you’re doing it," says Steve. Steve spent years being active playing hockey, golf and various sports. His wife, Hope, says while they were dating he sometimes had trouble with his wrist and began falling. After visiting several doctors and undergoing numerous tests, Steve was diagnosed with ALS in 2011. He was 28. Hope eventually had to leave her job as mental health specialist and become Steve’s full-time caretaker. She says the journey has been challenging but she’s inspired by her husband’s bravery. "At one point, Steve developed pneumonia," says Hope. "He literally died twice and was resuscitated." The couple credits EJCH’s staff, from the doctors, nurses, respiratory therapists and social workers for the incredible care he’s received while staying for weeks in the Intensive Care Unit (ICU). Steve recently painted and donated a piece of art to EJCH’s ICU to show his gratitude. "They’ve just been so amazing to us, helping us care for Steve’s infections, wound care, medical supplies, and just treating us like family," says Hope. 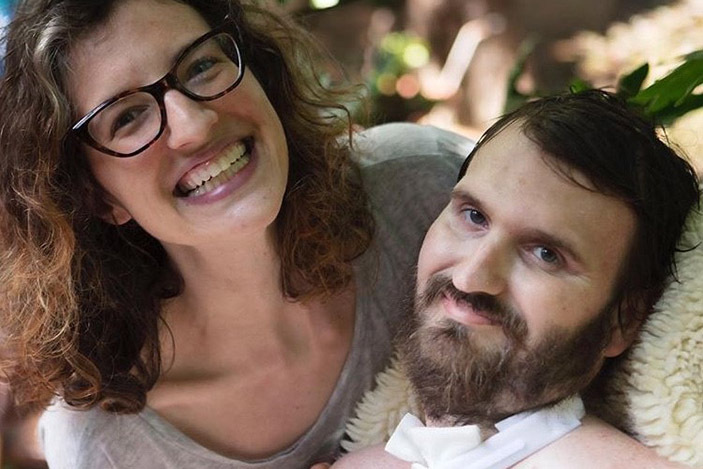 Although Steve is now in a wheelchair and uses a voice amplifier to communicate, he and Hope are still focused on living life to the fullest and cherishing each day. "Life’s hard enough and too short to be angry, depressed and negative," says Steve. "When you’re struggling to be happy, look at the things God has given you like the ability to type, breathe, talk and really think about the simple things, for in an instant they can be taken away." For more information about the work Steve is doing to raise awareness about ALS, visit driveforacure.com.